With a scenic riverfront, lush green space, and a fine National Historic District, Rices Landing is an “off the beaten path” destination for an enriching and exciting day-trip. On the western bank of the Mon River, this quiet town was a bustling river port in the 19th century. In the early 20th century, railroad and river barges transported coal here. Although no stores are located in the historic district, you can stock up in the nearby town of Dry Tavern. The Giant Eagle grocery store1, at 999 North Route 88; the Dry Tavern Beer Distributor2 next door; and Ozie’s Sport Shop3, located across the street at 1020 North Route 88, where you can purchase a fishing license, live bait, and other sporting goods, are all just minutes away. Once arriving in Rices Landing, take a self-guided tour of several National Historic Sites in the area. Park at the community building in Kolat Park, at 100 Water Street, home to an 1850’s, red brick, two-cell jail house with a bizarre tale. Read the plaque in front of the jail to find out what these walls would say, if only they could talk. Stroll down Water Street until you spot the red paneled “W.A. 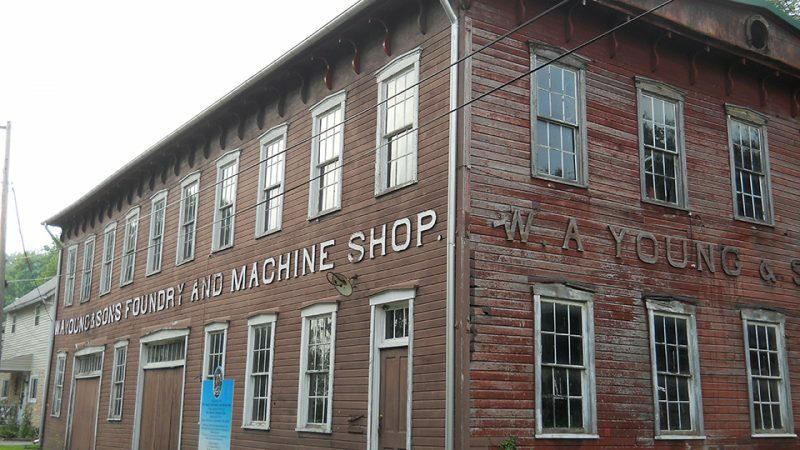 Young & Sons Machine Shop and Foundry.” This historic machine shop, a center of industry during the First and Second World Wars, closed its doors in 1965, but the century old operation has remained intact. Peek through the windows, or contact Rivers of Steeliv to find out when a guided tour of the shop is offered. Across the street is the Excelsior Pottery plant. 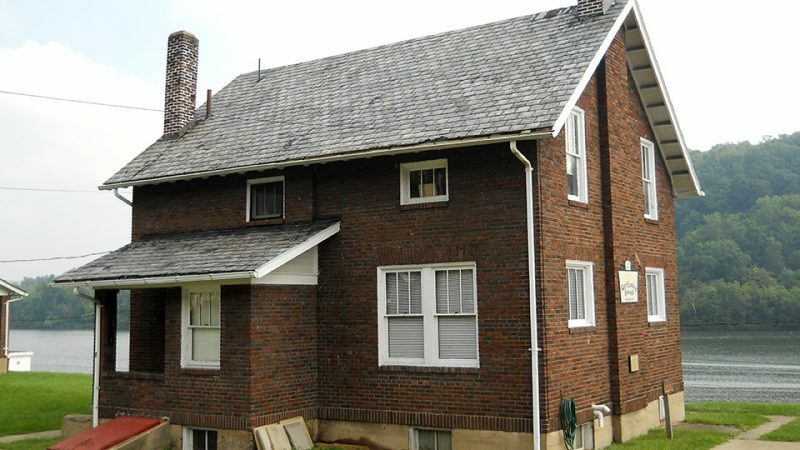 Now a private residence, this two-story building boasts original, blue clapboards, a stone foundation and gable roof with boxed cornice and returns. Like many structures you will see in the Historic District, this architecture was inspired by the Italianate, Eastlake, and Queen Anne styles, during the period between 1870 and 1910. Water Street will cross over the Greene River Trail, a 5.2 mile trail that extends north to Fredericktown and south to Crucible. Take this trail 0.8 miles east (right), until it crosses Main Street. You can walk (or drive) along Main Street for 0.2 miles until you reach the Rices Landing Borough Building, the second floor of which is now the Lock 6 Museum, open from 9AM-3PM on Monday and Wednesday. Directly behind the Borough Building sits the Art Deco Rices Landing National Bank. No longer operating, this site was once the focal point in town. When Rices Landing emerged as a key player in coal country, company houses, collectively referred to as the “Red Row”, were constructed by Frick and Company, along Main Street. Two examples of these two-story semi-detached company houses are at 128 and 130 Main Street, as well as the Union Store at the corner of Third and Main Street. Continuing on Main, you will come upon the United Methodist Church, erected in 1873, and its two-story rectory. This historical building marks the last stop on the Rices Landing historic walking tour. While known for its rich history, Rices Landing also offers opportunities for outdoor recreation. The gazebo located in Min Love Park, with its tables and barbecue grills, is an ideal spot to cool off on a hot summer day. After lunch, spend a lazy afternoon fishing along the river while youngsters can enjoy the pirate ship inspired playground. 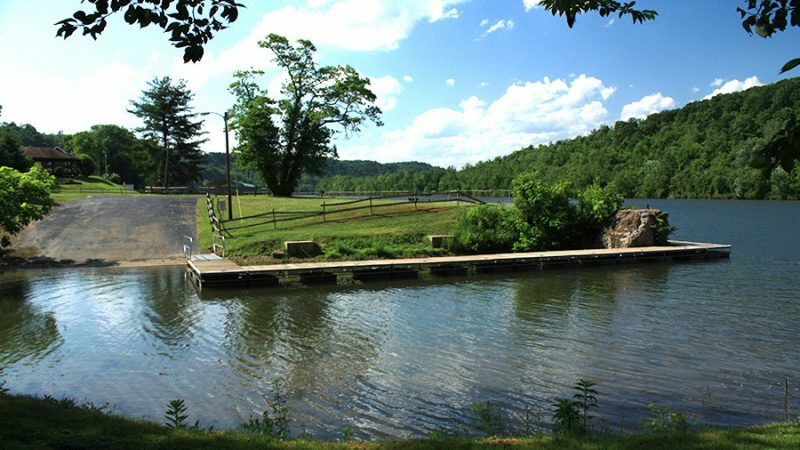 A boat ramp is available to launch your boat where Pumpkin Run and the Monongahela River meet in Min Love Park. For a more active afternoon, head back on the Greene River Trail. From the trailhead parking lot, bike or walk west 3.2 miles to the Greene Cove Marina in Millsboro, offering a full service restaurant and bar. For a shorter trek, head east for two miles toward Crucible, where the trail ends at the fork of Old River Road and Old Ferry Road. There are great views of the river in either direction. Check out the 67-acre Pumpkin Run Park for a quiet place to cool down. The entrance is located off of Water Street, across from the Old Jail Cell through the tunnel. Open daily between Memorial Day and Labor Day, the park offers fire pits, pavilions, and boat access to the Mon. The perfect combination of history, architecture, and the outdoors, Rices Landing is one of southwestern Pennsylvania’s best kept secrets.